The highlight of our column series patent plaques are the solid walnut wood columns which are artfully carved. These columns flank a beautiful presentation plate which features your patent's information in a traditional or contemporary style. 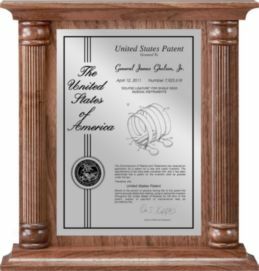 You can customize your patent plaque with the inventor’s names and your company name or logo. 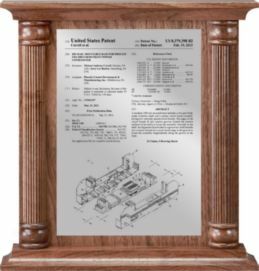 The column series patent plaques can be mounted on a wall, or you can use the included brass post to set this award on your desk or tabletop. Each solid wood patent plaque is custom-made and hand-polished to a beautiful shine. For help customizing your IP award, or to answer any questions, please call us at 1-800-932-1662 x104.